Singularity will cause job market disruptions! 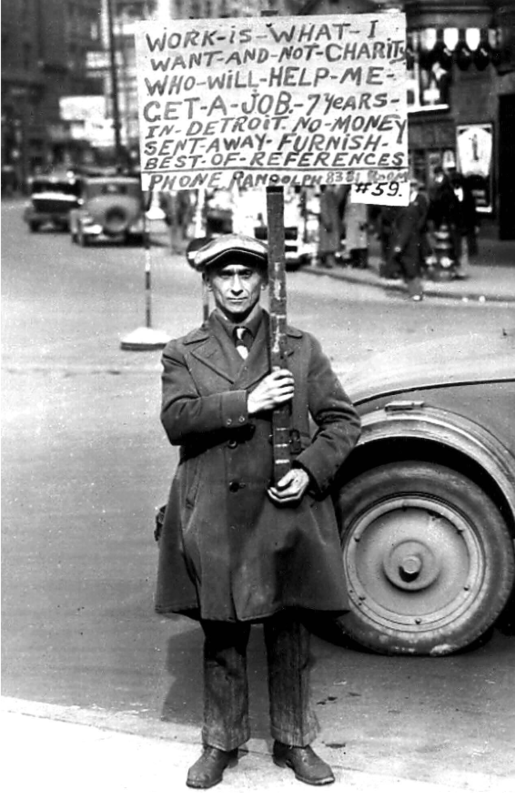 The 1930’s: Photo courtesy of the Detroit News Archives. Technological advances have destroyed jobs since the beginning of industrialization. However, new job opportunities requiring new skills are often created following layoff-periods. The time for adjustment and the flexibility of individuals to adapt to new job situations are of key significance for the impact of change. Consider the paradigm example of the automobile industry. Thousands of jobs were lost by the arrival of robot-assisted production lines. Yet thousands of new jobs were created for design, marketing and servicing the cars. Mass production had lowered the cost so more and more people could afford to buy a car. Many blue-collar jobs were converted to white-collar jobs. But not everyone was mentally ready to be retrained. To develop tools for artificial intelligence is a complex task. Research and development of AI algorithms, as for instance required for all kinds of machine learning applications, are the playgrounds for the world’s best mathematicians, computer scientists, IT and AI teams. Large high-tech companies such as Google or Facebook, IBM or Microsoft compete for the best talents. Early 2014 Google paid $400 million to buy DeepMind, a three-year-old AI company with about 50 employees. At the time of the deal, DeepMind had no finished products on the market, so it is clear that the purpose was 100% talent acquisition. In March 2016, however, DeepMind got worldwide attention as their software AlphaGo beat the world’s best Go player Lee Sedol in a 5-game match carried out in Seoul, South Korea. The match has been compared with the historic chess match between Deep Blue and Garry Kasparov in 1997. Go is a complex board game that requires intuition, creative and strategic thinking. It has long been considered a difficult challenge in the field of artificial intelligence (AI) and is considerably more difficult to solve than chess. Many in the field of artificial intelligence consider Go to require more elements that mimic human thought than chess. It will be no more than a few outstanding high-paid individuals who ultimately are the drivers of the advancing performance of AI systems at an exponential rate. On the other side, there are a vast number of people facing unemployment due to the consequences of this development. According to a 2013 study by Gallup, about 33 percent of white-collar jobs are in danger of being lost by increasing progress of AI and IT. Analytical tasks in finance, logistics, retail, health, research etc. are likely to be replaced by AI applications. Common to these tasks is to analyze data generated by business processes and to communicate the results. As AI machines learn to analyze big data and recommend or even make decisions, humans will have almost no chance to keep pace with or even outperform such machines. As you can see on this slide, the capabilities range from fine motor skills and navigating in the physical world to cognitive and social domains, sensing human emotion and producing natural language. 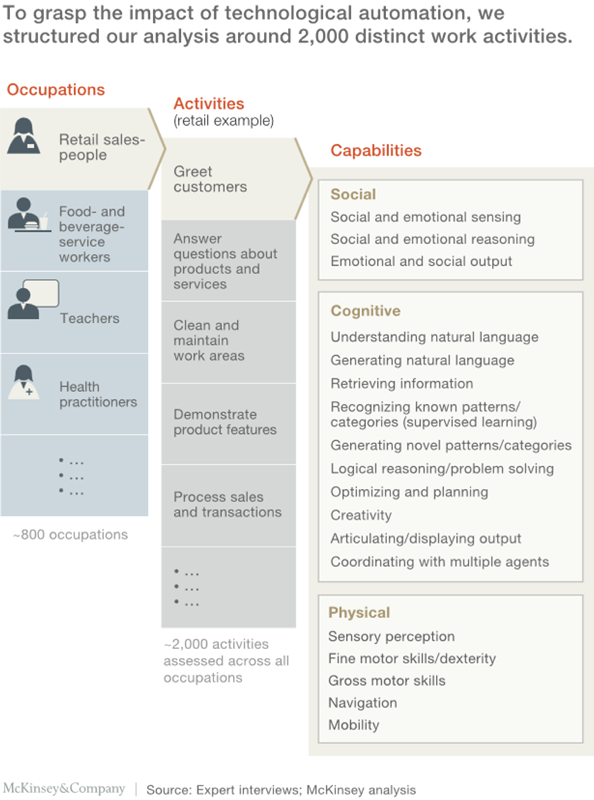 The McKinsey team then assessed to which degree these capabilities can be automated through the use of current leading-edge technology, adjusting the level of capability required for occupations where work occurs in unpredictable settings. Their bottom line is that 45 percent of work activities (white-collar and blue-collar) will be replaced by technology already at work today. If technologies processing natural language were to reach a medium level of human performance, an additional 13 percent of work activities in the US economy will be automated. This level of expected job displacements reflects how advances in AI will also challenge our assumptions about what automation actually means. Although many of us think of automation primarily in terms of low-skill, low-wage operations, it appears that even significant parts of the job descriptions of highest-paid leading positions, such as financial managers and senior executives, can potentially be taken over by powerful AI systems. According to the McKinsey report, the benefits of AI-transformed business processes are between three and ten times the costs. This includes estimates across industries, ranging from increased output to higher quality and improved reliability, as well as the potential to perform tasks at superhuman levels. As a consequence, businesses have no choice but to transform. It is well known that the adaptability to such transformation is strongly age-dependent. Swiss government statistics published in 2015 state that by 2045 more than 50% of the Swiss population will be over 65 years old. The average age of individuals is steadily growing. A male Swiss born in 1900 could expect to reach an average age of 53.2 years; born in 2013 the expected age is forecasted to be 89.4 years. A technological singularity due to an explosion of machine intelligence will cause job market disruptions at a magnitude rarely seen before. New organizational and social structures will be required to reap its chances and benefits in order to preclude economic and political crises as experienced during The Great Depression in the 1930’s. Present-day Economists state that The Great Depression could have been kept under control provided the financial policies, regulations and intervention tools in use today would have existed in the 1930’s. This should teach us that the time is now to think about the consequences of singularity and to plan ahead now to deal with its negative potential.